At least four people have been killed during waves of violent demonstrations in Egypt; as the protests enter a third day, authorities have threatened widespread arrests. Egyptian anti-riot police confront Egyptian activist outside a journalists syndicate in downtown Cairo, Egypt, Wednesday, Jan. 26, 2011. EGYPT IS BRACED for further demonstrations following two days of unrest that have left at least four people dead – as a result of the largest demonstrations the country has seen for a generation. The Egyptian authorities have been urged to show restraint following the confirmed fatalities, however the government has labelled the demonstrations “illegal” and has launched a crackdown, arresting about 1,000 reports AFP. Citizens have been warned that anyone taking part in anti-government protests will be arrested. Prime Minister Ahmed Nazif has said that his government was dedicated to the “freedom of expression by legitimate means”, the BBC reports. Meanwhile, the United States has called on Egypt to lift the ban on protests; Secretary of State Hillary Rodham Clinton called on President Mubarak “to implement political, economic and social reforms”. The Egyptian demonstrations began last Tuesday, inspired by similar protests in Tunisia. The Arab world has been electrified by waves of protests over the past number of weeks – sparked off by an single desperate act by a Tunisian street vendor last December: the self-immolation of the 26-year-old vendor, Mohammed Bouazizi, in protest at the confiscation of his wares, triggered a wave of street riots across the country. The demonstrations did not abate until the country’s strongman Ben Ali, who had been in power for 23 years, was forced to flee to Saudi Arabia. Bouazizi’s death proved to be a catalyst for the outpouring of public fury across the Middle East – prompting copycat suicide attempts and public demonstrations over repression, corruption and poverty across many countries including Egypt, Lebanon, Algeria, Mauritania, Morocco, Saudi Arabia, Sudan and Yemen. 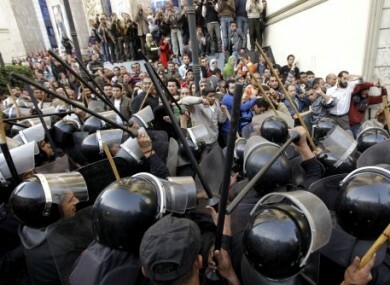 Email “More violence feared as Egyptian protests enter third day”. Feedback on “More violence feared as Egyptian protests enter third day”.